How big of a change should be needed before an edit is justifiable? For example a small grammatical error bugs the crap out of me, but I am too hesitant to fix it, whereas sometimes a question is either not written in "real" English, or not written well, and I feel like I should edit it, but what justifies (as rule) an edit? Even a single char can justify an edit. It really depends on the reason. Example: the other day Nathan posted an answer with the command ar in it and both Zanna and I thought: that is wrong, needs to be tar. Zanna edited it but it -was- a correct command (so it got removed again). Single letter edit that makes a difference and needs to be done. I think an edit is justified when it makes the post better, and that is doomed to be subjective! As you can see, we are not supposed to reject an edit unless it definitely fails to improve the post. 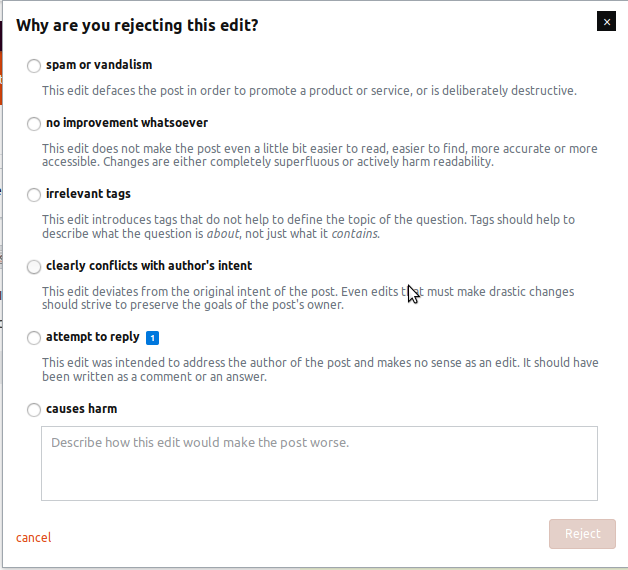 There is no option to reject an edit because it is "trivial". I very much value people taking the time to improve Ask Ubuntu by editing posts, and especially for drawing attention to the ones that need a lot of it, even if I feel the need to improve on the suggestions. If you have more than 2000 reputation, you can edit posts at will, and there's no reputation gain. Since I earned that privilege, I know I sometimes edit with less care than I did before, and make more trivial changes; since I'm not getting any green stuff and I'm not thinking about reviewers spending time and efforts checking my work, and since I can easily edit again and again if needed. But when reviewing, I try to approve/improve ANY edits that I would have bothered to make myself. So, from my perspective, go ahead and fix that comma splice (but others might think differently to me, and reject your edit). Shamefully I now only write an edit reason to communicate with the OP, for example "please use code formatting for code" or "please check that I have preserved your intent here - I couldn't tell if the # was your formatting or your code". Thinking about that, I'd like to draw attention to something that Shog9's answer raises in the post linked by Thomas' comment - the fact that someone wrote what you're editing and they will see your changes and your justification for them. I try to remember that I'm dealing with the work of a person as well as a part of our site, and to be respectful in my editing.